Reproduced from an original watercolour painting and used for a Christmas Card sent by Councillor and Mrs Robert Llewelyn Jones. We thanks them all for their kind permission to display this picture on our website. Conygar Stena’s plan for the regeneration of the waterfront, Holyhead will destroy Newry Beach. The Waterfront Action Group was set up to SAVE NEWRY BEACH for the people of Holyhead, visitors and tourists. 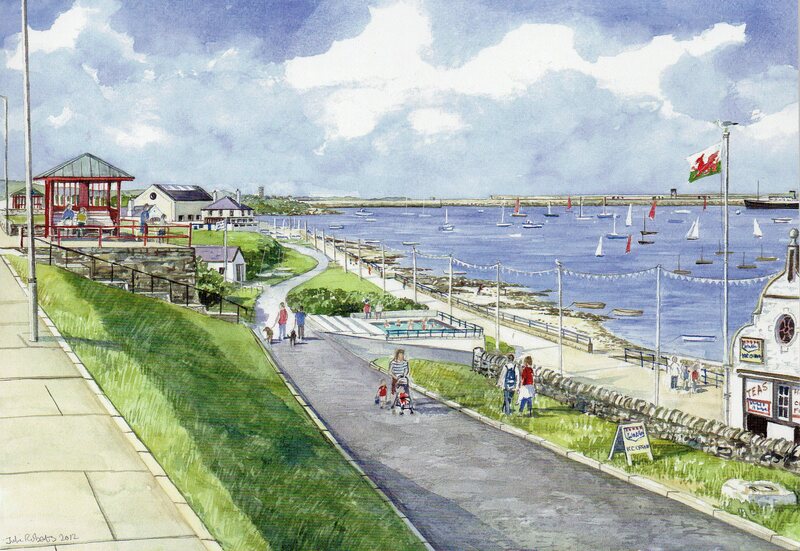 The beach has been a place for recreation, fun and leisure for decades and it is unbelievable that Holyhead Town Council and Anglesey County Council have supported the scheme and have granted outline planning permission in June 2012. The Waterfront Action Group meets regularly with up to 100 or so attendees. As the Group has grown we have recognised the need to have a new constitution with newly elected officers. The group shall be called Grwp Ymgyrch Traeth Newry, Caergybi / The Waterfront Action Group Newry Beach Holyhead (WAGNBH) and from now on will be referred to as ‘The Group’. To protect the Conservation areas of Holyhead and Holy Island, in particular Newry Beach and the surrounding areas, from inappropriate development. Membership will be open to individuals, groups within the community or businesses with an interest in promoting the objectives. Each person will become a Group Member and can vote at a Group Meeting. The day-to-day management of the Group will be undertaken by a Committee elected by the Group at the Annual General Meeting. but may be allowed to put their name forward for re-election, up to a maximum of three Officers. In addition, the Members shall elect such number of General Committee Members as they see fit to constitute a Working Committee. Committee Members with specific expertise may be co-opted for a period of time. The Committee may appoint Ex-Officio Members. These have no voting rights. The Group’s Annual General Meeting shall be held at the same time every year. The Secretary shall give 21 days notice to Members, of this Meeting. In keeping with the requirements of the Constitution, the Secretary shall also be responsible for sending out the agenda, nomination forms for Officers and Committee Members as well as a copy of the annual report and balance sheet for the previous financial year. The date of the AGM shall be posted in the local press. The Chairman shall chair each Meeting if present. Otherwise the Meeting shall be chaired by the Vice-Chair. If neither the Chairman nor Vice-Chair is present, the Group/Committee may elect a Chairman from the Group/Committee Members who are present. At least six of the Voting Members shall be present in order to hold a Meeting of the Group. All Committee and General Meetings will be minuted. The Secretary will keep a record of these minutes for inspection at all times. In each Meeting of the Group Members and the Group Committee, matters shall be decided upon by a show of hands. The person who presides over any Meeting of the Group’s Committee shall have the right to his own vote as well as a casting vote where the vote is tied. The Group has the right to administer the monetary fund to promote the objectives. Everything that is bought on behalf of the group, and is used by the Officers or the Members shall remain the property of the Group. If a Group Member leaves the Group or is voted out of the Group any such item shall be handed to an Officer of the Group. From time to time the Constitution may be changed, improved or added to, but only during the Group’s Annual General Meeting through a vote by at least six of the Voting Members present. Any change, improvement or addition to the Constitution should be made through a notice of motion and presented to the Secretary at least one month prior to the Annual General Meeting. If it is decided to terminate the work of the Group, no monies or possessions belonging to the Group (following the payments of debts or outgoings) may be shared between the Group Members. Rather, they will be given to other Groups or Charitable Societies with similar objectives to this Group. The Group may be wound up through a vote when at least six of the Group are present. At Marina Cafe and Bar, Holyhead Marina, Newry Beach, Holyhead.